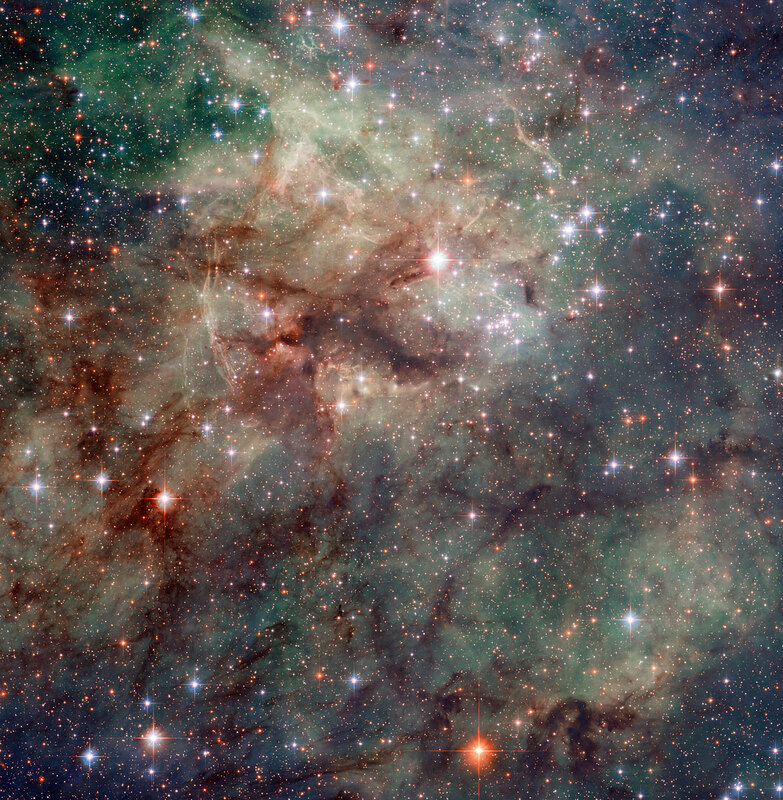 The NASA/ESA Hubble Space Telescope has produced an outstanding image of part of the famous Tarantula Nebula, a vast star-forming cloud of gas and dust in our neighbouring galaxy, the Large Magellanic Cloud. 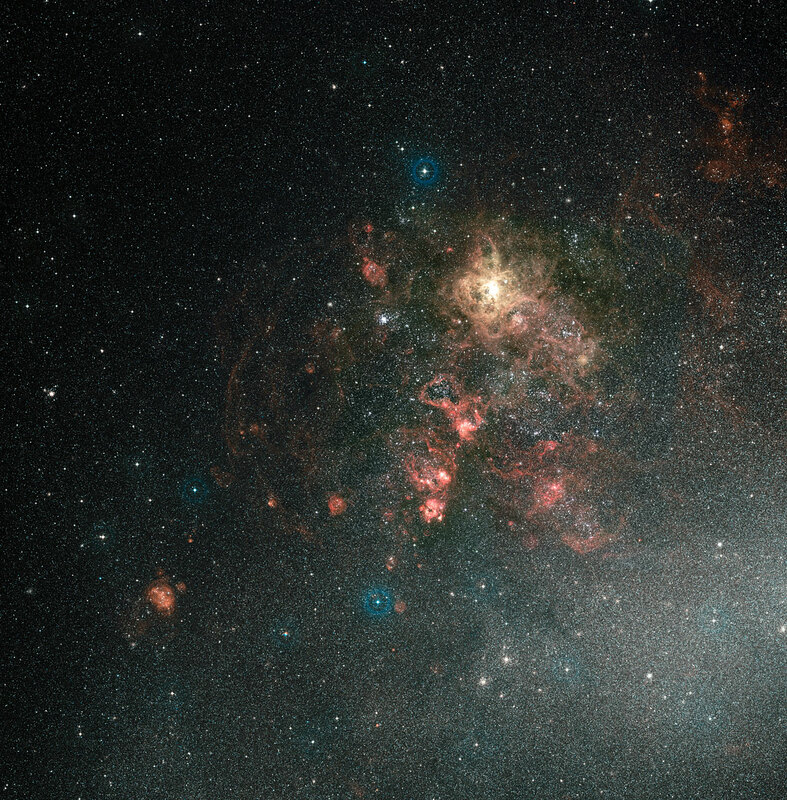 In this picture, we see a close-up of the Tarantula’s central region, glowing brightly with ionised gases and young stars. The wispy arms of the Tarantula Nebula were originally thought to resemble spindly spider legs, giving the nebula its unusual name. The part of the nebula visible in this image from Hubble’s Advanced Camera for Surveys is criss-crossed with tendrils of dust and gas churned up by recent supernovae. 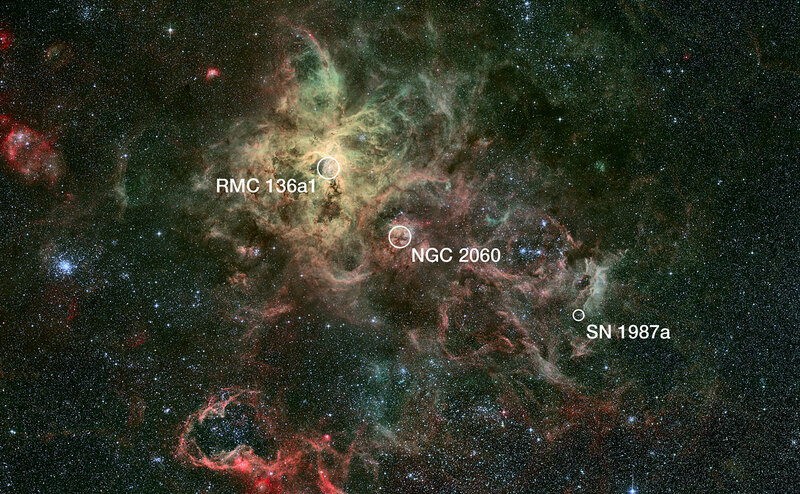 These supernova remnants include NGC 2060, visible above and to the left of the centre of this image, which contains the brightest known pulsar. 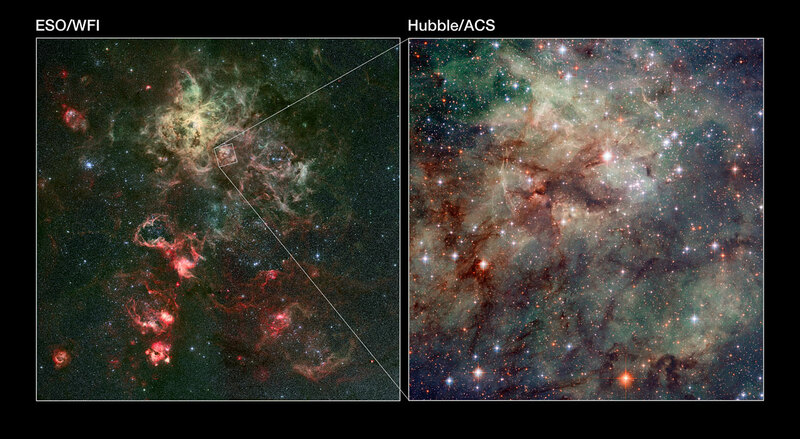 The tarantula’s bite goes beyond NGC 2060. Near the edge of the nebula, outside the frame, below and to the right, lie the remains of supernova SN 1987a, the closest supernova to Earth to be observed since the invention of telescopes in the 17th century. Hubble and other telescopes have been returning to spy on this stellar explosion regularly since it blew up in 1987, and each subsequent visit shows an expanding shockwave lighting up the gas around the star, creating a pearl necklace of glowing pockets of gas around the remains of the star. 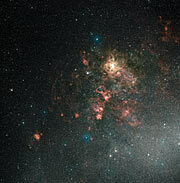 SN 1987a is visible in wide field images of the nebula, such as that taken by the MPG/ESO 2.2-metre telescope. Together with dying stars, the Tarantula Nebula is packed with young stars which have recently formed from the nebula’s supply of hydrogen gas. These toddler-stars shine forth with intense ultraviolet light that ionises the gas, making it light up red. The light is so intense that although around 170 000 light-years distant, and outside the Milky Way, the Tarantula Nebula is nevertheless visible without a telescope on a dark night to Earth-bound observers. This nebula might be far away, but it is the most luminous example of its type that astronomers have observed in the local Universe. A compact and extremely bright star cluster called RMC 136 lies above and to the left of this field of view, providing much of the radiation that powers the multi-coloured glow. Until recently, astronomers debated whether the source of the intense light was a tightly bound cluster of stars, or perhaps an unknown type of super-star thousands of times bigger than the Sun. It is only in the last 20 years, with the fine detail revealed by Hubble and the latest generation of ground-based telescopes, that astronomers have been able to conclusively prove that it is, indeed, a star cluster. But even if the Tarantula Nebula doesn’t contain this hypothetical super-star, it still hosts some extreme phenomena, making it a popular target for telescopes. Within the bright star cluster lies star RMC 136a1, which was recently found to be the heaviest ever discovered: the star's mass when it was born was around 300 times that of the Sun. This heavyweight is challenging astronomers’ theories of star formation, smashing through the upper limit they thought existed on star mass.